The US economic reports did not influence EURUSD that much and now all eyes are on the NFP data which will be released on Friday. 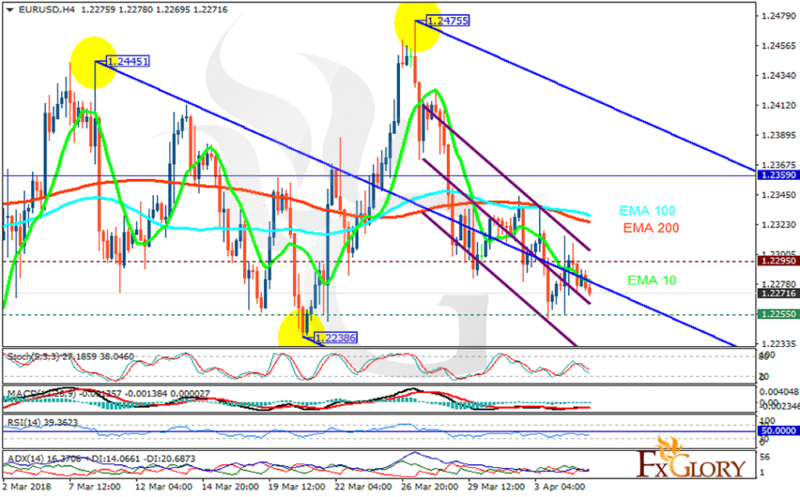 The support rests at 1.22550 with resistance at 1.22950 which both lines are below the weekly pivot point at 1.23590. The EMA of 10 is moving with bearish bias in the descendant channel and it is below the EMA of 200 and the EMA of 100. The RSI is falling towards the oversold area, the Stochastic is showing downward momentum and the MACD line is on the signal line in the neutral territory. The ADX is not showing any clear signals. EURUSD will be consolidating within the support and resistance area. The support level breakthrough will drag the price down within Andrews’ pitchfork.